Don't just take our word for it; check out these testimonials from other parents! Thank you again for being our partner in shaping our awesome son. I really mean that. The values Camp Towanda and you and Stephanie instill in children that are fortunate enough to attend are so positive and meaningful. Thank you for all that you do. You make such a HUGE difference in so many children/families' lives, it must be so rewarding. You are so special! Visiting Day on Sat was one of the best days I've ever had with my kids. My kids could not have been happier and in better spirits (I need to know what you are feeding them so they can be like that all year round!!). Your entire staff could not have been better hosts. Both Jake & Sydney were confident and comfortable in their surroundings, plenty of friends, millions of activities and not even one complaint about the food!!! I give you the credit for making Camp Towanda what it is, a very very special place. We are thrilled; very impressed with the camp but more so with you and your staff-you did great and thanks for taking care of them. I LOVE getting your emails and communications. This is what I tell all of my friends. I am a big fan. Friends of ours will be visiting your camp for their kids this summer. I can't say enough of how you handle the kids and parents. Don't change a thing. You guys are great and it truly shows. Not only do you run a camp, you live it, breath it and it is a large part of you both. Thank you. Thanks for all of the emails they truly give us a small window into what is happening in camp! Everyday we look forward to reading your letters and we thoroughly enjoy reading each and every one of them! We wish we could be flies on the wall to be there in person to get first hand accounts of all that is going on. Jared and Sara are so very lucky to have you and Stephanie and the wonderful staff that teaches them and offers them priceless experiences, something not every kid gets to do. After reading the past few emails- which of course we're not used to getting until 2am- we are more convinced than ever that Towanda was and will always be the right place for Jared and Sara. You all are so creative and innovative. YOU REALLY TAKE THE TIME AND CARE about each and every aspect of camp life- how you pulled this olympic theme off ( and quite honestly wasn't sure how you could top last year's breakout) was Outstanding! Again, we can't thank you all enough for everything. was all to take place. Thanks for another great summer. Together my boys have 10 summers at Towanda. Each Visiting Day, I hear the same words, this is the best summer ever! We feel very secure having our kids under your watchful eye. The staff we meet all seem top quality. I really felt that the kids working at Towanda are a cut above. Your vetting process produces kids that seem like they want to be there, are very friendly and outgoing and quality. Working for you is almost a reference for future endeavors. Good job, care to interview a few employees I am considering? I know my biggest challenge is getting others to deliver my product my way every day. It's not easy and you do it so well. I read your last email and felt jealous. I know it's a lot of work, but it also has to be a lot of fun. I am happy for you and I am happy that 6 years ago, we chose Camp Towanda. We got that right. We wanted you both to know that when your child writes and tells you they are having the "best summer", you can't help to think that as a parent, you have done something right! As you know our past two summers have been a little crazy but camp has kept us all grounded. Our girls feel it is their second home. We must admit to you that we wish we were there with all of you. 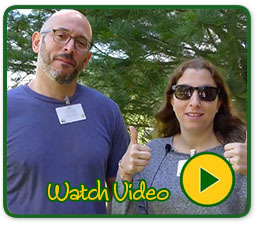 We were once campers as well as counselors and know what a special experience sleepaway camp is. Thank you from the bottom of our hearts for taking care of our girls, for making them smile from ear to ear and for keeping camp, camp! No cell phones, no computers, just good, clean fun. We can't believe how quickly the summer is going. We want to tell you that Adam had a great summer at Camp Towanda. He loved it and can't wait to go back. He loved his counselors, his bunk, the activities and the food! Thanks to you and Stephanie and the staff for giving him such a great experience. On behalf of all of us, we thank you and want you to know how much we appreciate the special environment you provide for our kids to become young adults of real integrity, values, and warmth. Thank you, once again, for a great summer. The girls had an AWESOME summer! They loved the fact that they were able to be their wild, crazy, fun selves in an environment where they were appreciated for it. Hopefully, they enriched your already great atmosphere by modeling for people that you can act in a leadership capacity and be nice to EVERYONE, no matter their personality, age, etc. 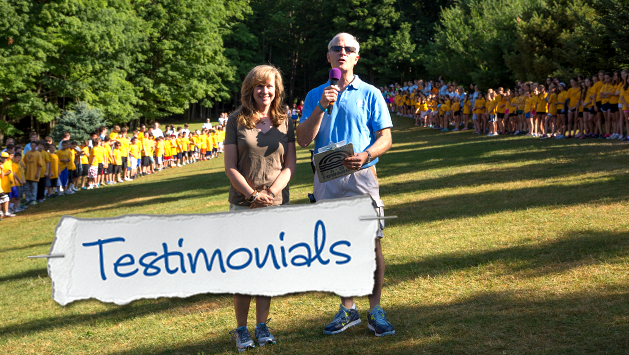 We really appreciate the hard work you, Stephanie, Jared, and the staff put in to making camp such a special place. Tonight, I looked over at Jessica and marveled at how confident and poised she has become. I just want to tell you how happy we are that we are part of the Towanda family! Yes, believe me, I wish I could be a fly on the wall and see exactly what happens there. But even if we can't, we see firsthand the changes in Alex and Sam. It truly is a privilege to be able to give them this experience, and we all know it. I think that the life skills they learn and the spirit they now have will be with them for the rest of their lives. Thank you for a fantastic summer and for taking good care of our family. The boys both had "the best summer ever" this past year. They are really such great poster children for Towanda. I have heard both argue that they go to "the best" camp among their friends. Tyler & Harris. have been getting such a great dose of just enough independence to develop confidence and good judgment. They both are looking forward to the privileges that come with becoming upper campers next year. You guys are awesome partners in parenting. I want to thank you and your staff. Evan had the most fabulous summer and grew so much as a person. He couldn't stop talking about camp for at least the first three weeks he was home. I knew his experience at Towanda would be truly awesome. He loved all of his bunkmates, the counselors, and especially Olympics. It was such a source of peace for me knowing that he was so happy, having the time of his life. Towanda is truly a special place and so are you and Stephanie. Let's start by saying that J. can't stop talking about how great last summer was and he is counting the days until he returns to Towanda. And thank you for everything. Camp is his favorite place on earth, and that is quite a reflection on the Reiters and their staff. You and Stephanie pour hearts and souls into this camp and the impact it has on the kids is indescribable. Thank you for another exciting, amazing, wonderful summer. Happy 4th of July! We're having a great summer too and we wanted to thank you, once again, for providing our children with a "home away from home". I was explaining "Camp" to a friend of mine the other day, and I told her that Towanda might be our girls' FIRST home. I don't think they consider it their "home away from home", it just feels right to them. After all of these years, we still don't know what it is, but you certainly have gotten the recipe perfect!!! Towanda is the only place in the world where they spend so much time without us, yet we don't even worry about them for a second. It's thanks to the two of you and all that you do to make it an unbelievable experience for them. Thanks again and keep up the good work. Looking forward to Visiting Day when we can be part of the "magic"!!! Thanks for yet another AMAZING summer. Every time I think it can't get any better, it does. I'm not sure how you work your particular kind of magic- keeping all the old traditions that I loved so much as a camper and then taking them giant steps forward. It's the best microcosm of the world that exists for these kids, and I hope they realize how lucky they are to be in it. As far as my girls go, they will arrive home in a big blue funk, spend countless hours with their camp friends of facebook, then finally get around to talking with us about the summer. It's a funny kind of mourning period but I get it and I respect it. There's just nothing like camp. Again, thanks for everything you do to make each summer the best summer ever! Thanks for everything. My boy's home. He's going on ten, but by the way he sounds after seven weeks at Towanda, I'd swear he's much older. Seven weeks is nothing to a 42 year old, but to an almost ten year old it's substantial. The way he holds himself, the confidence he exudes when talking about his summer, and the pride he has in having been part of something so much larger than himself it's all good. I just got off the phone with my best friend, a guy I've known since we were (coincidentally) nine years old. As I was expounding on the many reasons he should send his son to Towanda I paused before the next line erupted from my mouth, because I could barely believe what I was about to say... "there was never a day this summer when I worried that he would be okay." I've worried about leaving this little person with a baby sitter for three hours on a Saturday night! What has happened to me? Towanda is like a well-oiled machine. Nothing to worry about there. Oh, and the tuition to gain the right to this security for the parents, this life experience for our children, this game changer? But then I go online and see the pictures, get Mitch's emails, receive a letter from my son, "Camp is great!" Finally, the summer ends and while jockeying for position amongst the other parents I see my son climb down the steps from the bus. He runs to me, holding me tight for a few seconds. He looks me in the eye and says, "Dad, I missed you so much." I ask, "Do you want to go back next summer?" He replies without hesitation, "I would go back tomorrow." And we walk away together, my arm around this small man - my son and me. We're both just a little older but a whole lot wiser. And my son, my oldest child is walking a few inches higher off the ground after an amazing summer at Towanda. I miss being a camper. Hello Stephanie and Mitch. We are tremendously grateful to you! Thank you for taking such a personal interest in our children and thank you for listening and understanding. You are extremely incredible camp owners. You are extremely incredible people.